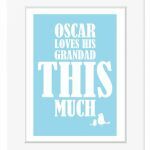 Lovely bespoke prints, fully personalised with your chosen names - a perfect gift for Father's Day, Mother's Day, Valentine's Day or a special anniversary gift. About your Print: Your artwork will be created to order and printed onto high quality gloss finish paper stock. It will be posted with a backing board and smooth white finish bevel cut mount, and sealed in a protective clear presentation sleeve. Your print will be posted in a strong hard backed envelope and will require a signature on delivery. The overall size of the mount is 10"x8" and will fit into any standard 10"x8" picture frame. 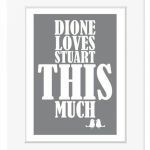 Please note the prints do not come framed, but will fit into standard frame sizes which are readily available on the high street). How to Order: Please use the space provided on the order form to enter the wording you would like on your print (eg, 'Oscar loves his mummy' or 'Jane loves John' or 'Emily loves her daddy' etc). Please double check your spelling before submitting the order as mistakes cannot be rectified once your print has been produced. You can also choose whether you would like an adult and baby bird motif, or two adult birds featured on the print - just make your selection using the drop down menu below. What happens next: Your print will be created and dispatched via 1st Class Recorded Delivery (signed for) post within 2-3 working days. Please allow approximately 1-3 working days for your print to arrive.